“Competition is the incentive to progress.” The students are exposed to various competitions like Olympiads, IAIS - Macmillan, National Interactive Maths Olympiad, Geography Talent Test, Maths Talent Test, Times NIE– Spell Bee, Deiva Tamil Sangam and Sanskrit Sloka Chanting and so on. Swami Vivekananda’s birthday is observed as National Youth Day. 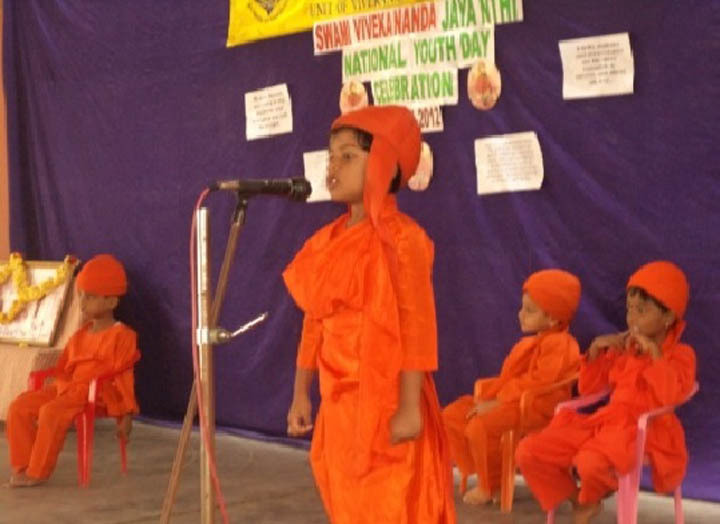 Various competitions are conducted in connection with Vivekananda Jayanthi. Students depict their talents in various fields like Recitation, Elocution, Essay writing, Drawing, Music, Dance and Drama. Several programmes are planned in connection with150th Birth anniversary celebrations of Swamiji. Parents are given an opportunity to grasp the message of Swamiji by taking part in the competitions like Rangoli and Essay writing.